Cute evening picture of Inu Yasha and Kagome. Looks like Inu Yasha likes this human festivity! It is touching because Inuyasha & Kagome are happy. Good scan, keep the good work up! 4th of July! or something like that...anyway! nice scan! 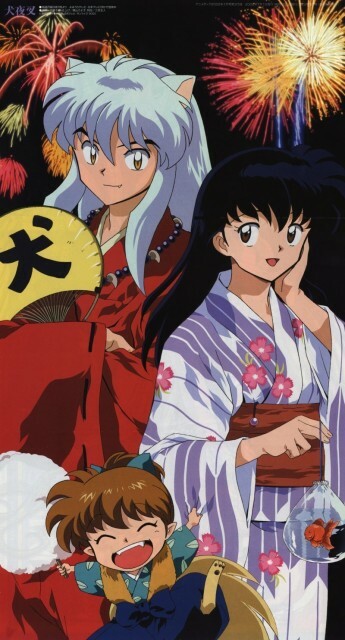 Very cute image of the three, Inuyasha's smile is always a plus. Old fav I lost long ago on my pc. great scan they look so cute... thanks for sharing!